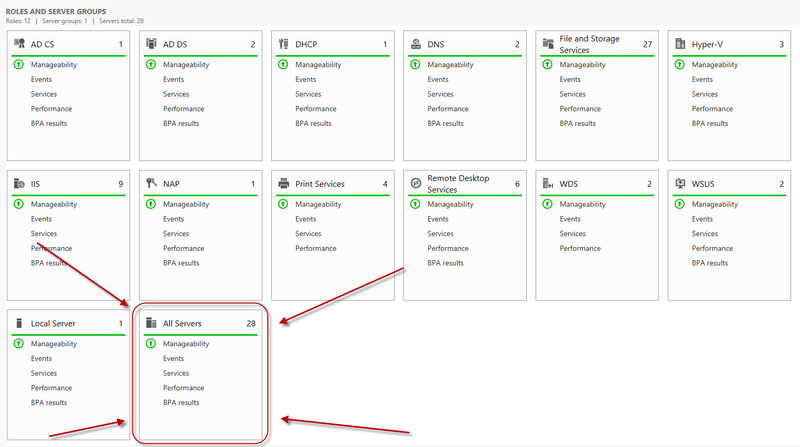 Microsoft System Center Suite: Windows Server 2012 Server Manager "Red Services"
I've been using Server 2012 heavily now since release and in particular the new Server Manager that's thrown in your face whenever you log into a server I've come to find very useful. However... One thing that always niggled me is by default it alerts you to EVERY service known to man that is stopped. 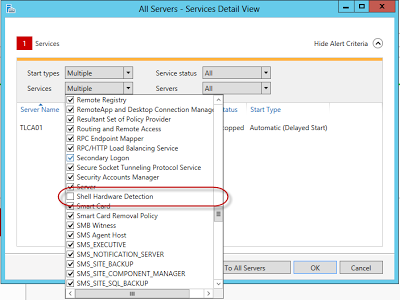 This is brilliant for alerting you to services that really should be running but it also catches one service in particular that will 99% of the time always be stopped but is set to a startup type of Automatic, the Shell Hardware Detection Service. 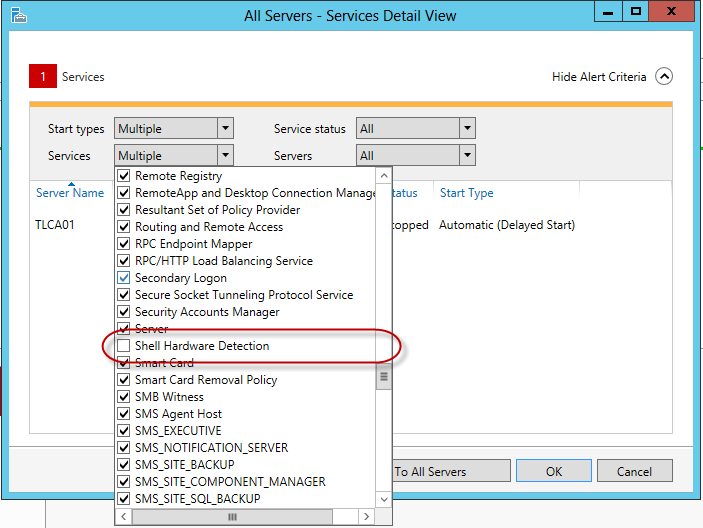 The behaviour of this service was modified in Server 2008 to stop when a user logs off to reduce the attack surface. This results however in a default sea of red for your console. The fix for this is very simple really. 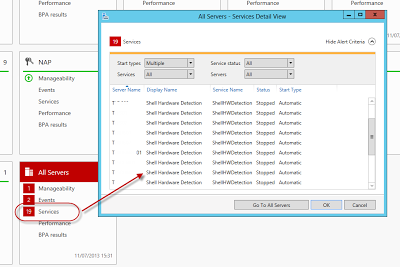 Click the Services link in the offending dashboard box, usually the All Servers one. 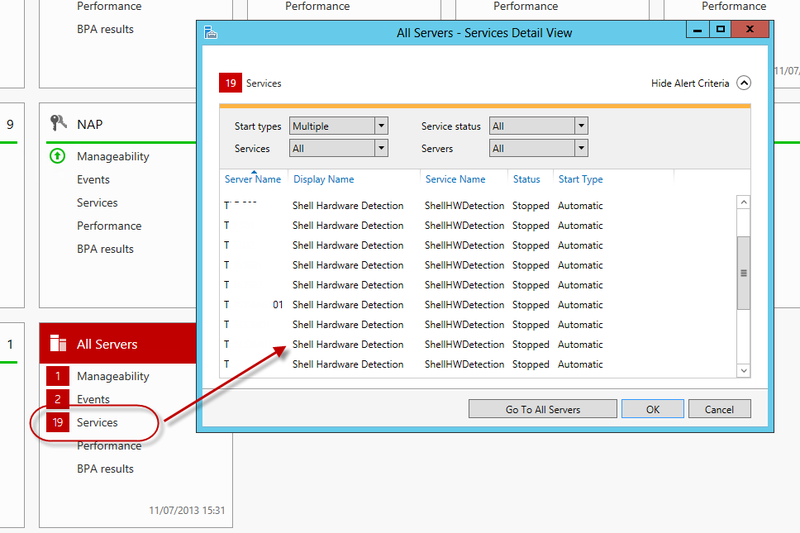 Drop the list of Services down and look for Shell Hardware Detection and untick it. And there we go, a nice filtered display, hopefully green. At least now when it goes red you know there is actually something that needs attention! 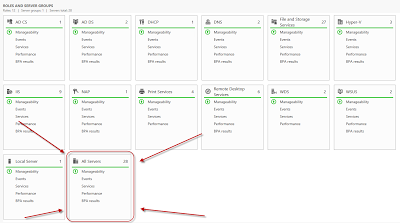 This setting will also be saved so you don't have to do this every time you open Server Manager. We have been using 2012 for quite a while now and never saw this until today. We rebooted the server and the problem went away. We didn't need to stop the service mentioned in this post. Great job. These are the hints need to know.